You can see it in action in this simple patch: Sequencer demo.axp (16.9 KB) , you simply have to put both files in the same folder. 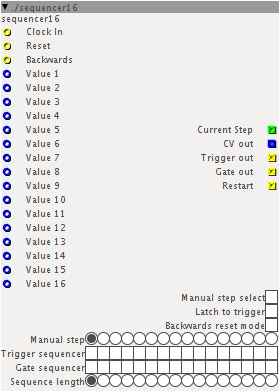 -Create 16 dial objects and connect them to the respective blue inlets (value 1-..-16), you'll need these to provide the desired control values. -Connect the clock inlet to your clock source (a simple lfo can do the job). The sequencer will go one step forward for each clock tick. Clock in: Pretty self explanatory, you must connect it if you want the sequencer to run. It's strongly advised to use it, however the sequencer will run even without it. Value 1-...-16: The 16 values to sequence. You can connnect these inlets to dial objects, but also to other fractional stuff. This kind of setup allows great freedom. Current step: outputs an integer number (0-15) correspondent to the active step. You can connect it to a disp/ibar16 for a visual reference of the sequencer, but you can also use it to furthermore expand sequencing possibilities. CV out: provides the sequenced values. -Sometimes the sequencer starts from step 2 when axoloti is powered. You may want to restart it manually using the reset inlet. Feeding random pitches into a sel_fb_16? we've been discussing both change and counters behaviour at initialisation time, but was too drastic a change to put in 1.0.3, need some time to think it through. I also tested the loadbang trick, and indeed doesnt work, which indicates a small issue in subpatch initialisation which will have a look at. Interesting though, I noticed if you add a +1 object in-between the const and change, it will actually work in a subpatch... the plot thickens. I updated the sequencer! There are new features such as a latch mode and i corrected the backwards mode issues! Thank you good sir for this quite fabulous contraption! trigger 1 sends control 16 value. I will do some experiments, however. Is the problem related to the trigger thing or does it happen also with the CV sequencer? Did you try moving the sequencer object around in the patch? Errors occur quite often due to the execution order of the patch. thanks for this @Sputnki - decided to start fresh today and ended up with some pretty haunting results. loving all the sequencers that're available! Could this be related to order of execution? This happened to me a few times after creating a chaotic patch and then trying to reorganising it. After moving the objects around, to organise, the order of execution had changed. But not sure about this at at all. It just struck me that it could be related. Maybe try moving the subpatch around in the main patch and see what happens? Was actually wondering how order of execution is processed when subpatches are in the patch. Does Axoloti load the whole subpatch and all the included objects before loading next object in the order? subpatches are executed using the same execution order as other objects. so, they are 'called' in the parent according to their position, then the entire subpatch is processed (using the same execution order principles within the patch), then the next object in the parent patch. Cool. That makes sense. Thanks. Yeah I am not sure about it(order of execution) yet. I checked the tutorial 25. From looking at tut25(object nr 6 is moved only 1 step up and changes the output value of the whole chain of objects) there can be a huge difference from just moving the object one step up or down. And that kind of makes me think even more that Alex issue could be releated to order of execution. Anyway, not worrying to much about it. probably the time it will catch out most, is when the patch first starts. its always a bit tricky to do this with graphical programming environments (unlike text ones, wheres its obvious) ... if you look at Max,PD and Reaktor they all have similar complications. Yeah true. Last night I was doing a little bit of work on a wavetable editor and for that patch, order of executions is very important. moving around some objects has a a huge impact on the phase of the wavetable and how it is displayed in the scope. Id say for a normal synth lalala thingy, I wouldnt worry about this, but if you are trying to build something very precise, order of execution is very important. And it is something that its necessary to get a little bit familiar with, cause it does matter way more than we think. But I guess it is not the first thing to worry about when getting an Axoloti, but if you are serious about patching, it is neceasrry to learn about it and be aware of how it impacts your patches. really cool Thanks. But I am having trouble with using the version of muxer 16. Only blue and green versions seems to work. The red, the yellow and the one for using strings do not work. Some time ago I tried fixing it but with no luck. Did anyone manage to get this working in all versions? it is something that its necessary to get a little bit familiar with, cause it does matter way more than we think. This is my experience too... it is actually very important for all kind of patches, but as you say when you start out usually you can 'get by'. I did discuss this with @johannes the other day, its something where unfortunately there is a 'big step up', and where 'debugging' the patch can actually be pretty difficult at times (e.g. polyphonic patches). its possible to imagine better debugging tools, but they are all pretty complex to implement... but perhaps one day. 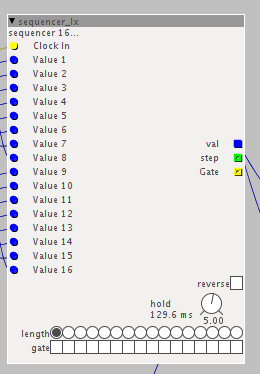 also perhaps we can one day better visualise the chain, reaktor has a mode where it temporarily numbers the execution order, its not great but its something. the biggest culprit is centring objects in the vertical axis. you need to keep the title bars of the object aligned, otherwise you will significantly change the ordering. Im sure @johannes has some ideas, and I will at some point mull over it for a bit.